A serious capacity crisis: Demand for endoscopy and pathology services, which provide key diagnostic tests for bowel cancer, has been increasing dramatically. However there is a serious lack of capacity to meet the demand. This is having an impact on waiting times, with many people waiting too long between being referred and having their test. 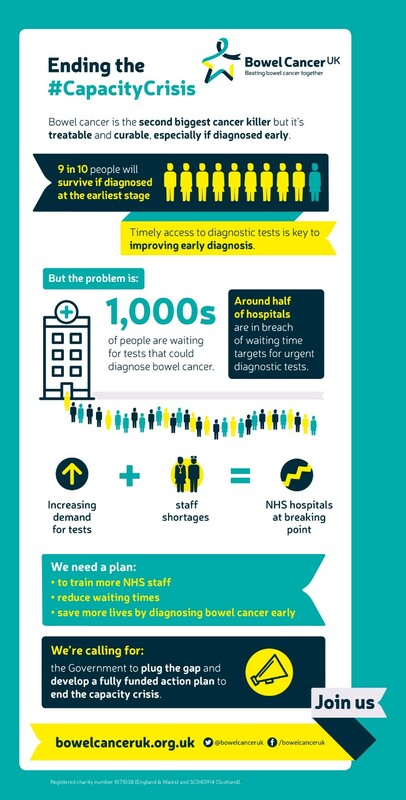 Without adequate capacity to meet this demand, patients will continue to be kept waiting for crucial diagnostic tests. Delays to the new screening test: Scotland is the only UK nation that screens from ages 50 to 74 using the faecal immunochemical test (FIT). FIT is vital for improving the chances of an early diagnosis as it has the potential to detect more early stage cancers than the current screening test; it can be adjusted to be more or less sensitive to traces of blood in poo, so more or fewer cancers can be picked up. Deciding what level of sensitivity FIT should be set at, considering the impact it will have on endoscopy, has contributed to the delays to its introduction. The quality of endoscopy service varies across the UK. Many units do not meet the quality standards set out by the Joint Advisory Group for Gastrointestinal Endoscopy (JAG). This means that some patients are being referred to units that are not up to standard and whose quality cannot be assured. With the added pressures that the expected increase in demand for diagnostic testing will bring, ensuring services continue to be of the highest quality is vital to stopping people dying. A fully funded action plan to tackle the growing capacity crisis. This must be comprehensive and set out clear recommendations to: address current workforce shortages; reducing waiting times; and bringing all units up to JAG accreditation standard. Read our open letter to the Chancellor and the Secretary of State for Health calling for an end to the Capacity Crisis, signed by over 7,000 people. An optimal screening programme that screens from the age of 50 using FIT, in line with Scotland and international best practice. There needs to be a clear timetable to increase the sensitivity of FIT and extend the age range in line with diagnostic capacity. England and Wales announced they are lowering the bowel cancer screening age from 60 to 50, following a recommendation from the UK National Screening Committee. This is something we’ve campaigned on for some time now and comes not long after we supported Lauren Backler to hand in her petition to lower the screening age from 60 to 50, in line with Scotland, which received a staggering 446,921 signatures. A change in the new GP referral guidelines for suspected cancer so GPs can refer patients at lower levels of risk than applied with the previous referral criteria. This means patients with persistent 'low risk' symptoms can be assessed more quickly and improve the timeliness of their diagnosis. 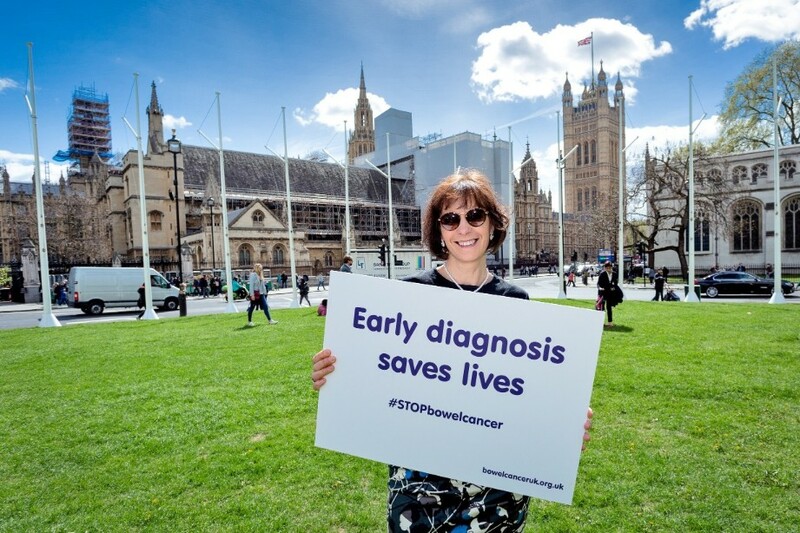 Helped shift the focus to improving diagnostic capacity in the new cancer strategy. Become a campaigner. Join the thousands of people campaigning to help make real change happen for people with bowel cancer. Share your story. If you’ve been kept waiting for a test for bowel cancer we want to hear from you.